The memorial is one of a series of large granite mountain boulders, all about the same size but of different shapes that comprise the “Open-Air Westminster Abbey of the South.” Each memorial contains a bronze plaque with date of birth and death and a statement about the person’s significance to southern culture or in some cases their relationship to Calvary Episcopal Church. Images: Plaque | Rear view | View of memorials at "Westminster Abbey of the South"
Plaque, rear: ERECTED 1928 / BY / ARKANSAS DIV. / U.D.C. Mrs. George Hughes, President of the Arkansas Division, United Daughters of the Confederacy made the official presentation and Mrs. J.F. Weinmann gave a tribute to the life and work of Albert Pike as the principal speech of the day. Albert Pike is the only Confederate general to have had a statue erected in Washington, D.C. Carved at the base of this statue are the words, "philosopher, jurist, orator, author, poet, scholar, soldier,” an inscription similar to the one on the Fletcher plaque. Yet some of his contemporaries could have added "libertine, traitor, glutton, incompetent, murderer." Pike is also rumored to have assisted Nathan Bedford Forest in crafting the rituals of the Ku Klux Klan. Calvary Episcopal Church is located at 2840 Hendersonville Road, at its intersection with Old Airport Road in Fletcher, NC. Eighteen “Open-Air Westminster Abbey of the South” markers stand in two rows in a lawn area facing Old Airport Road to the right of the church. 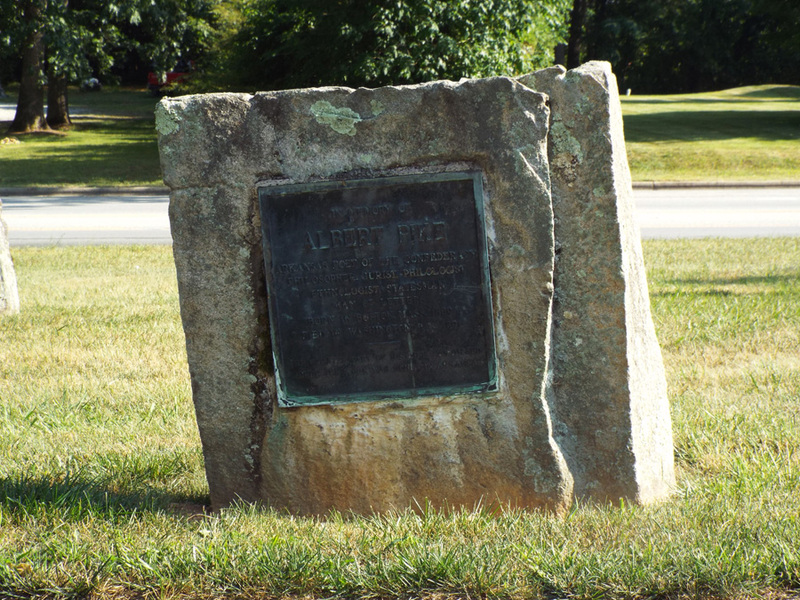 The Robert E. Lee Dixie Highway is located near the street facing Hendersonville Road. One memorial to Bill Nye is in the church cemetery and the second memorial to Bill Nye is on the front lawn of the church. The Calvary Episcopal Church marker stands near the sanctuary. This memorial is one of eighteen “Open-Air Westminster Abbey of the South” markers that stand in two rows in a lawn area to the right of the church. 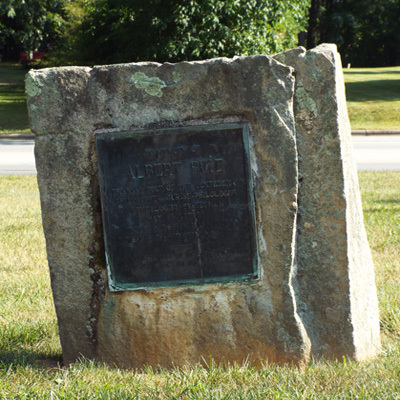 This memorial and the seventeen others now standing along Old Airport Road were originally located in a landscaped plot along Hendersonville Road (Highway 25) directly in front of the cemetery. It is likely they had to be relocated when the road was widened to four lanes.